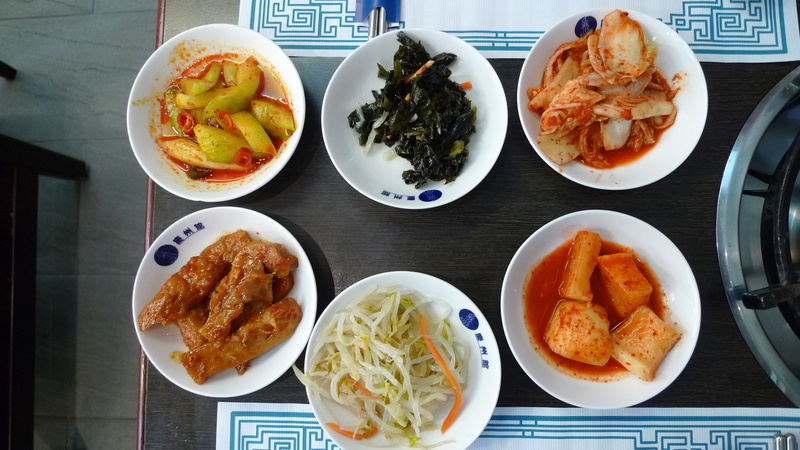 I really love Korean food, a lot. My friend Mike and I decided to get dinner Saturday night and settled on Korean food. 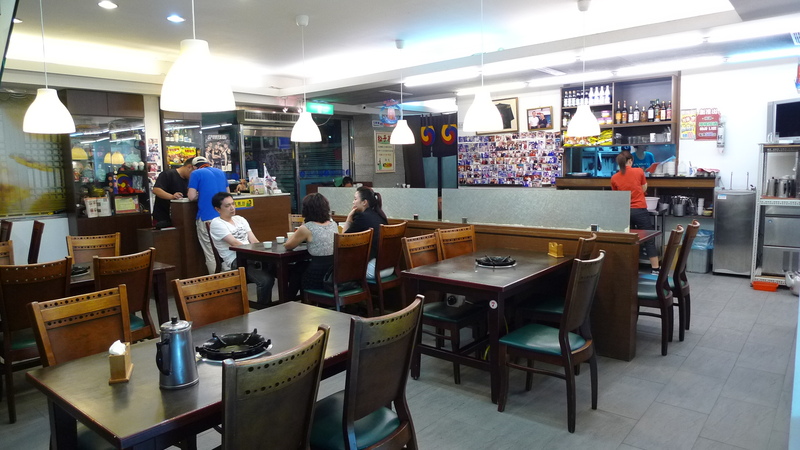 We originally wanted to go to MinDong Korean Restaurant (明洞館), but couldn’t get a reservation. So after further research, Mike found Gyeongju Korean Restaurant via hungry girl’s blog and so we decided to give it a go. Gyeongju Korean Restaurant is south of Nanjing E. Rd. MRT station on Fuxing N. Rd., about a 5-10 minute walk from the station. The entrance on Fuxing N. Rd. is kind of hard to see, as it is inside a building and there is no sign visible from the street; it is next-door to a Cosmed and on the first floor of the building. 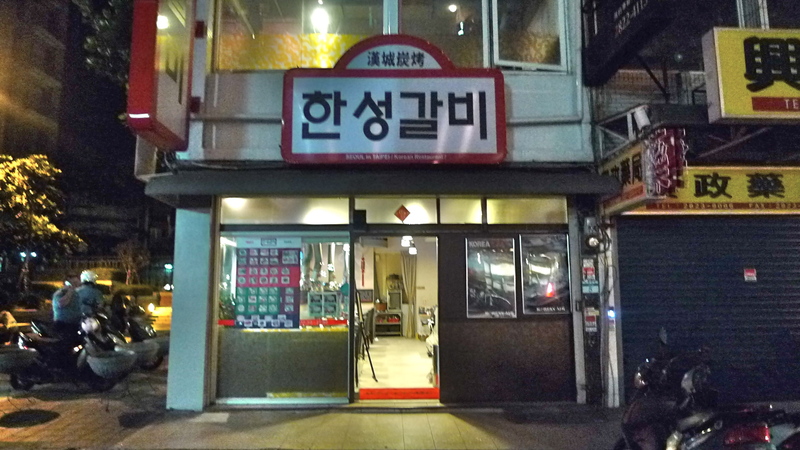 From pictures, it looks like if you go around the backside of the building the restaurant has a huge sign, but I did not see it. It looks like the restaurant has two floors, although I didn’t get to see the upstairs. The downstairs has maybe 10-12 tables, each equipped with a flame for bbqing. We got there around 8:15pm and were sat right away, although when Mike had originally called at 7pm they said they were full. 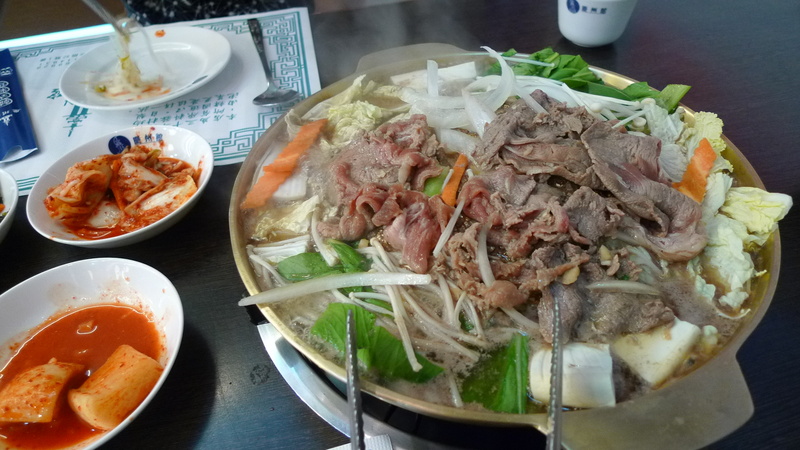 We chose the beef, seafood onion pancake, traditional Korean stone pot rice, and stewed spicy tofu soup. 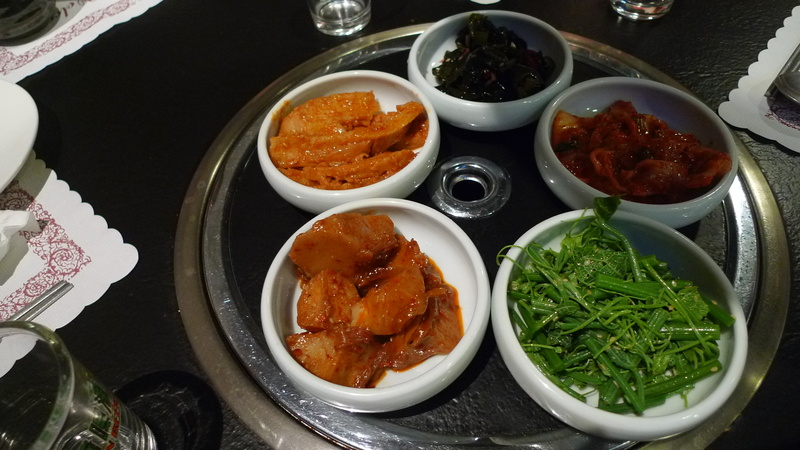 First thing that came out was the banchan (side dishes). From top left (clockwise) there was spicy pickled cucumbers, seaweed, cabbage kimchi, radish kimchi, bean sprouts, and fish cake. I thought all of the side dishes were pretty good. Nothing was that spicy. The kimchi was pretty good, it had a good balance of vinegar, spice, and sweet. I prefer my kimchi to be more on the vinegary side, so this was good for me. I think I expected the bbq to be a grill, but it was more of a “grill” in the center with a moat of broth around the edge for vegetables. 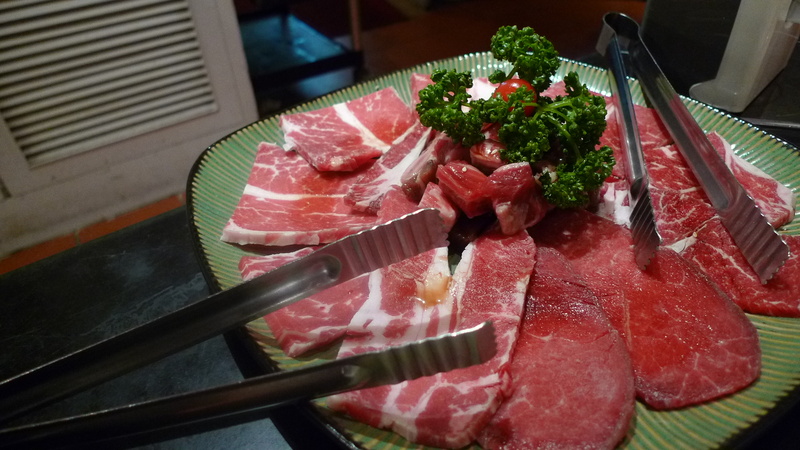 The beef was pretty good and tasted like it was marinated; it had a slight sweetness. 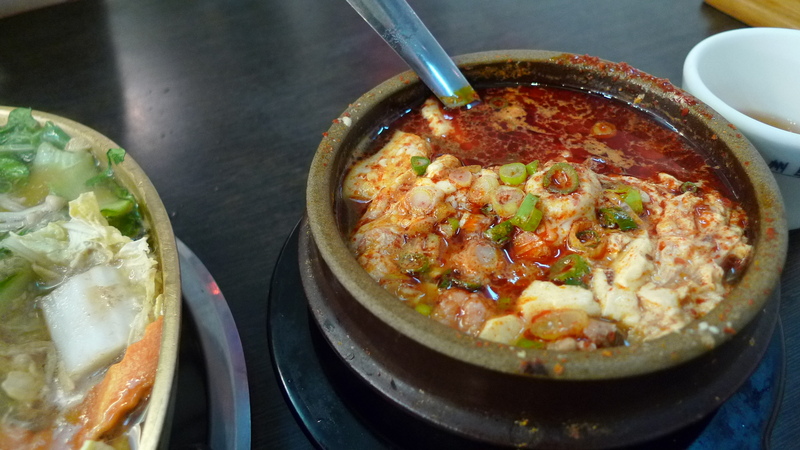 When the stewed spicy tofu soup, sundubu jjigae, came out it looked like it was going to be spicy. In reality, it really wasn’t. The bright red layer of oil is misleading. Nonetheless, the soup was pretty good. There was seafood (octopus and clams) in the soup and overall was pretty good. It had a good seafood flavor to it, although it could have been spicier. 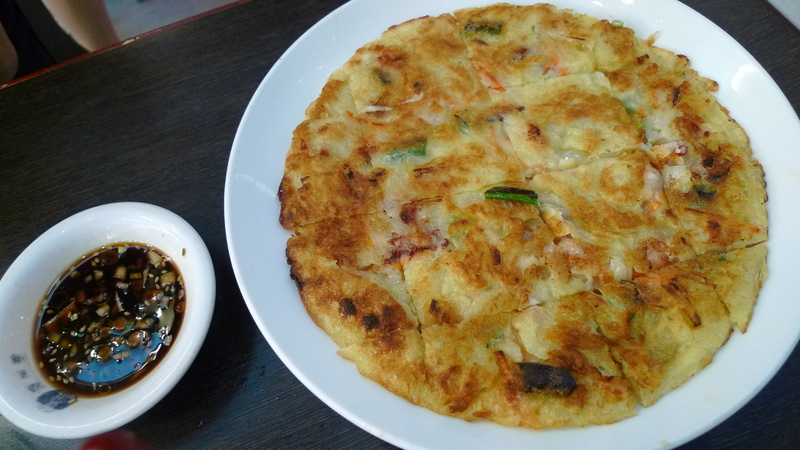 The seafood onion pancake was probably my least favorite thing in the set. It’s not that it was bad, it was just a little bland. I felt like the pancake was really doughy and didn’t have enough filling. 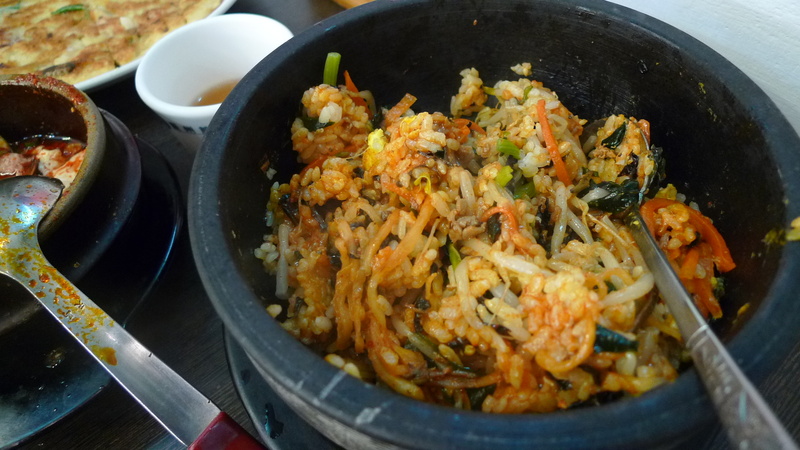 The traditional Korean stone pot rice (stone pot bibimbap) was not bad. It was pretty standard, pretty tasty, and came to us already mixed. There were the standard vegetables in it, nothing weird or unusual. It could have used more spice, like most of the things we had, but overall it was good. 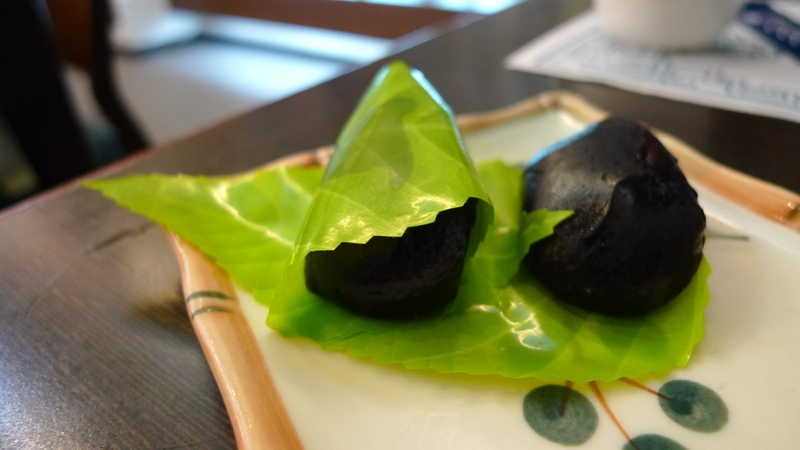 The waitress said that this was brown sugar mochi with red bean filling. The texture wasn’t really mochi like, it was more jelly like. I wasn’t a huge fan. I’m not really sure what this drink is, but it came to us with the mochi. 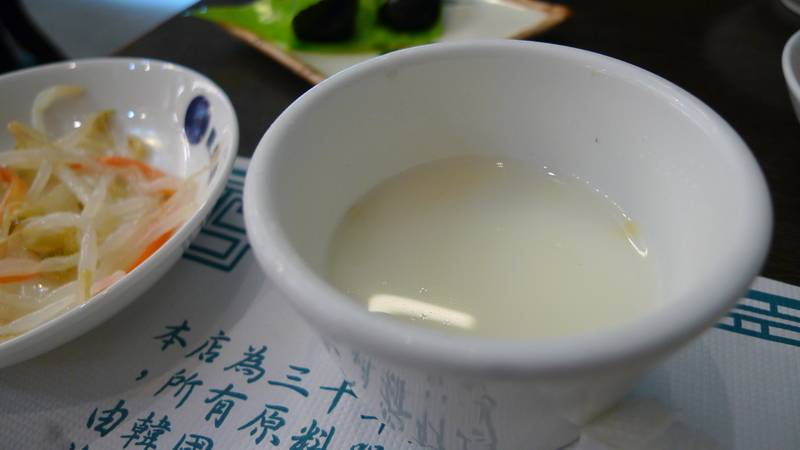 It tasted like a really light almond tea, although I’m not sure what it actually was. It was good though. For the most part I thought this place was pretty great. The set meal for two was a pretty good deal. For less than 500NT each we got a lot of variety and were pretty full. I would definitely come back and try some of the other things they have on the menu. A friend of mine, who is Korean, is on a quest to find the most authentic Korean food he can in Taipei before leaving in July. 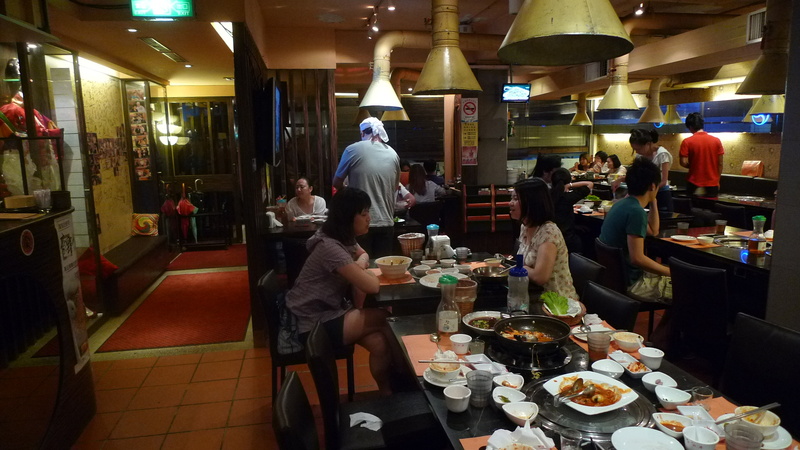 Based off a blog post he found online, we found ourselves at Seoul in Taipei. 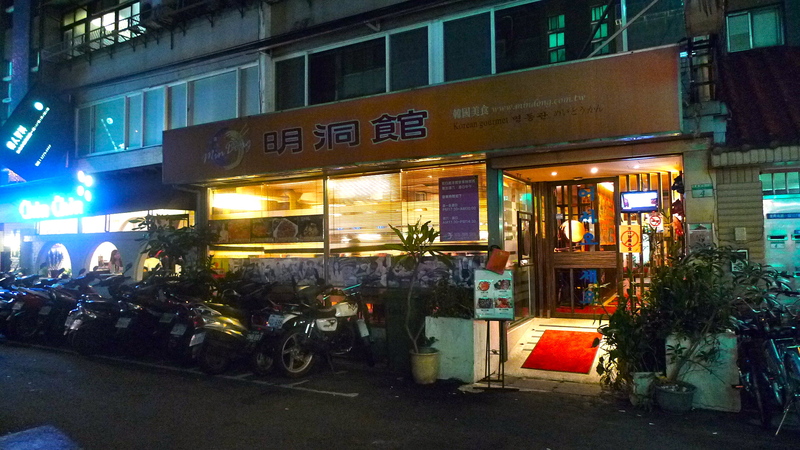 Seoul in Taipei is about a 5-10 minute bus ride from the Shipai MRT station (exit 1). The restaurant itself is two floors, although the top floor was not open when we went. On a Thursday night at about 7:30pm the place was empty, which was a little discomforting, but shortly after being sat, the bottom floor filled up. 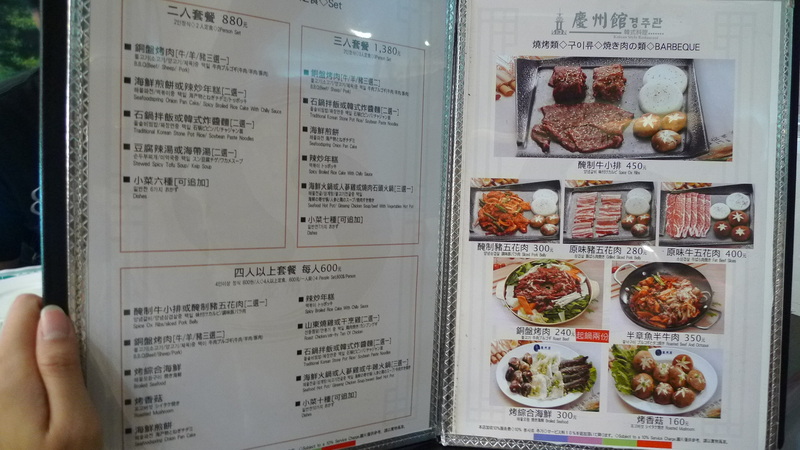 The menu is in Chinese only and had pictures of every item. 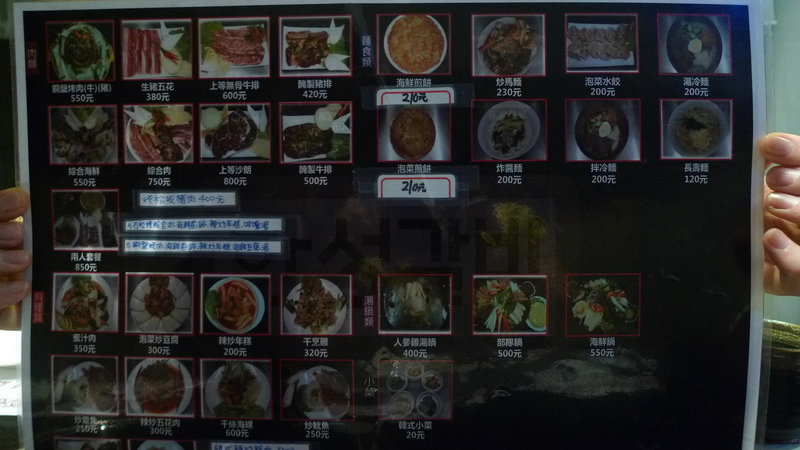 The menu isn’t super extensive, but it has your basic Korean dishes: sundubu, bi bim bap, rice cakes, bulgolgi, galbi, etc. We decided to share four dishes between four people so that we could try various items. 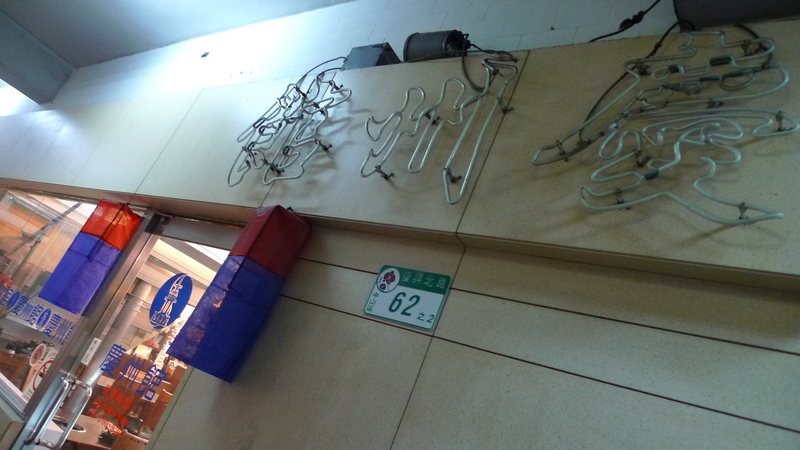 I was surprised that they didn’t have any Korean beers, only Taiwan beer…Although, they did have soju. 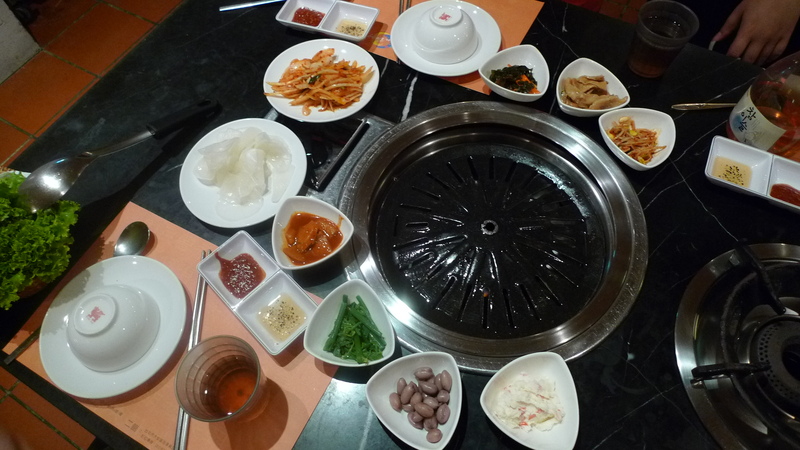 First thing that came out was the banchan. At first we were a little worried that we were going to have to order banchan because we saw it on the menu, but it is free, as are refills. We were given five types: kimchi, seaweed, potato, fish cake, and whatever green vegetable that is. Everyone liked the kimchi, it was pretty standard, definitely could have been spicier in my opinion. 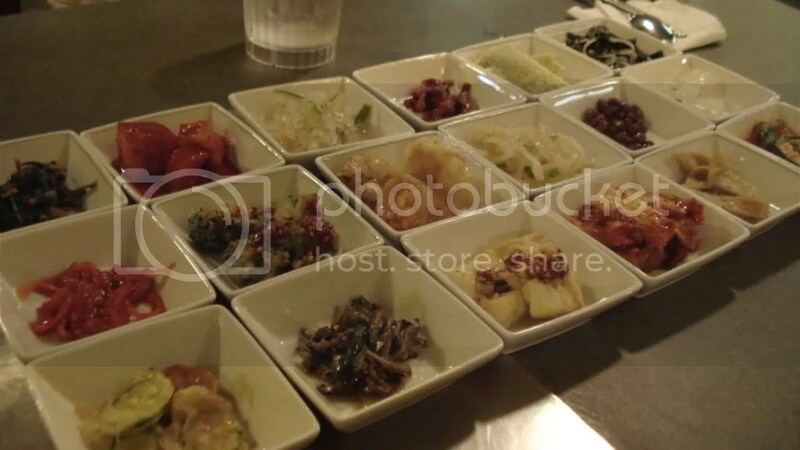 Really, all of the banchan was good. I mean, none of them were amazing, but none of them were bad either. We ordered the bulgolgi, which came with a small bowl of soup. The bulgolgi was okay. Our table seemed to like it, but I wasn’t particularly impressed. I felt like the beef was a little tough and over cooked. The flavor was pretty good, but the meat itself was a little disappointing. 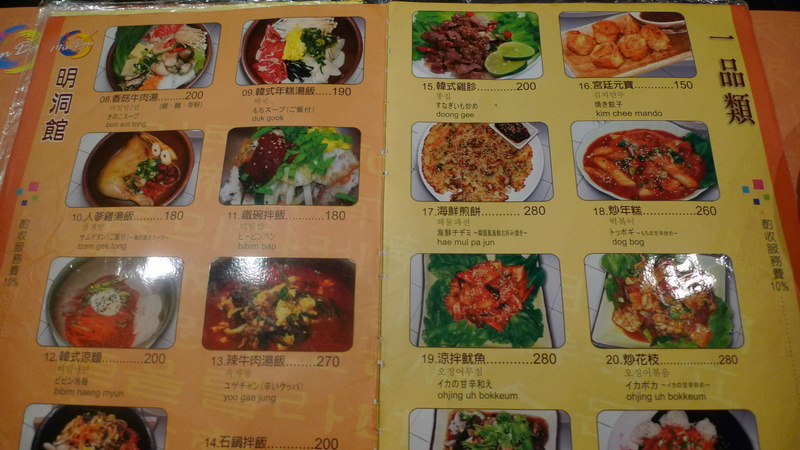 My choice was the cold noodles (伴冷麵) for 200NT. 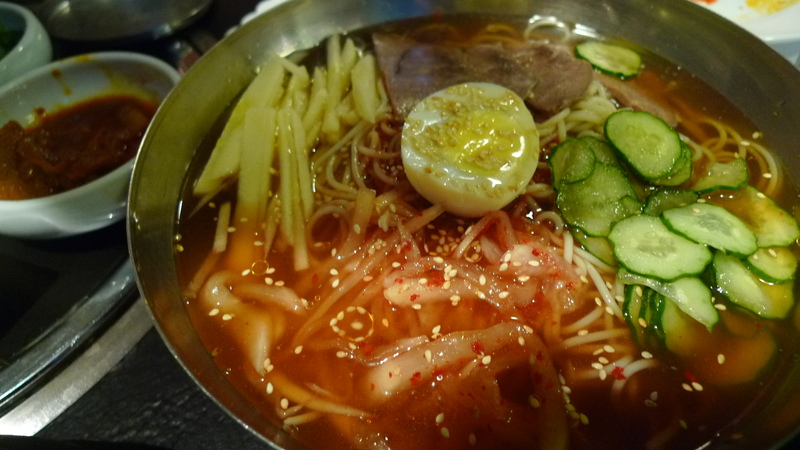 The noodles were topped with apples, pickled cucumbers, kimchi, pork, half a hard boiled egg, and some sweet red sauce. I thought this wasn’t bad. I kind of liked the mix of flavors and the crunchy texture of the apples and cucumbers with the noodles. The sauce was a very very mildly spicy sweet sauce that worked with all the ingredients. This dish was very similar to something I ate on my last trip to Korea, which was the specialty dish of some specific region. I felt like the rest of my table wasn’t a huge fan of this, but I liked it. So one of the reasons we ended up here was because a member of our party specifically wanted cold noodles with soup (湯冷麵). However, this was not what he was expecting. 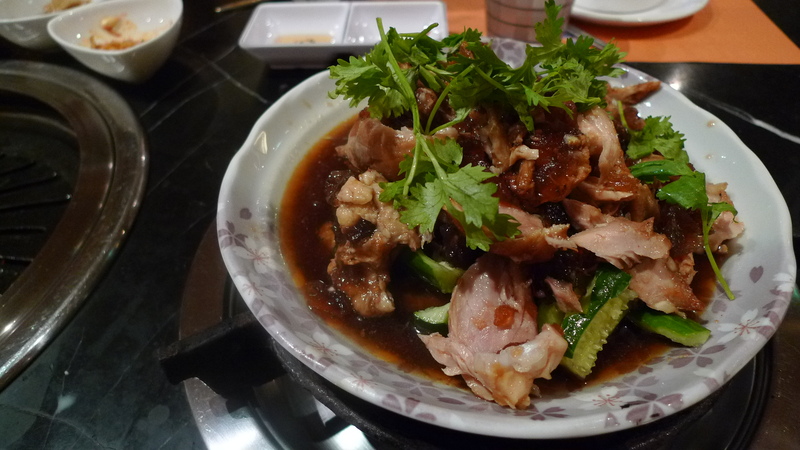 This dish, for 200NT, was basically EXACTLY the same as the cold noodles, but with a cold kimchi soup poured over it. 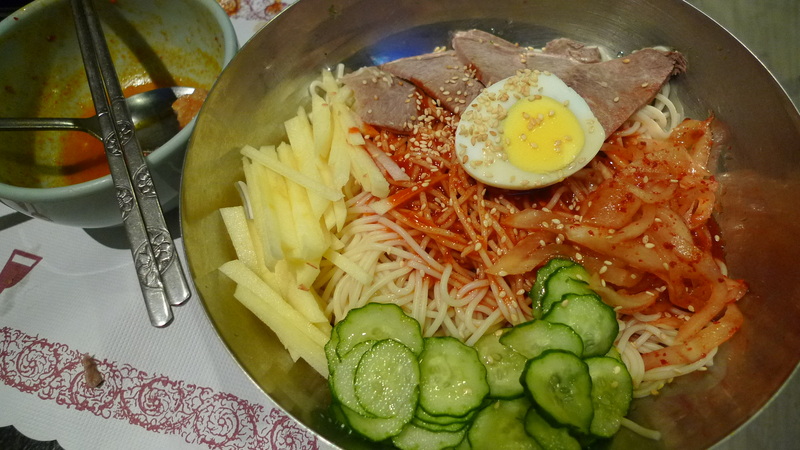 It had apples, cucumbers, pork, kimchi, and half a hard boiled egg, just like the previous dish. Only difference, the sauce was in soup form. The dish he was looking for had a clear soup, not this red soup. This dish wasn’t bad, it just was not what anyone was expecting, although, we should have known better based off the picture on the menu. 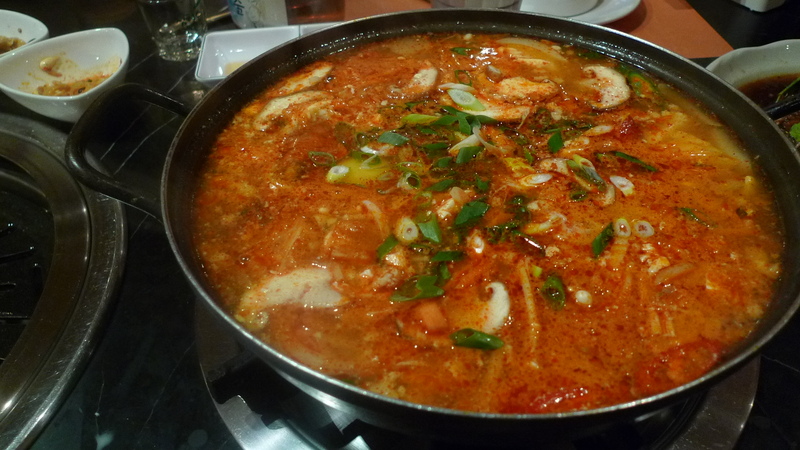 We also ordered seafood sundubu (海鮮豆腐湯) for 250NT, which includes a bowl of rice. This dish was pretty popular amongst the table. It wasn’t that spicy, so for people who fear spicy Korean food don’t worry because this isn’t Korean spicy. The soup was pretty good and it had good flavor. Honestly, I felt like it was a pretty standard sundubu though; it wasn’t particularly memorable in anyway. Overall I thought this place was okay. I don’t know. I kind of feel like I was a way harsher critic than the rest of my party, including my Korean friend. The service was good; even though the closed at 9:30pm, the waitress was really nice and told us to take our time. This place is not bad, it’s just not memorable. I would probably never feel the need to come back, but at the same time if someone was like, “let’s go to Seoul in Taipei”, I wouldn’t say no. However, with a name like Seoul in Taipei, this was not Seoul in Taipei. hours Mon.-Sat. 11:00 a.m. – 11:00 p.m./Sun. 12:00 p.m. – 11:00 p.m. I was on some mission to find all the best restaurants in the Oakland/Berkeley area, so I yelped all the foods I liked and bookmarked them. Feeling like Korean food, Dan and I decided we’d go to Jong Ga House in Oakland near Lake Merritt. 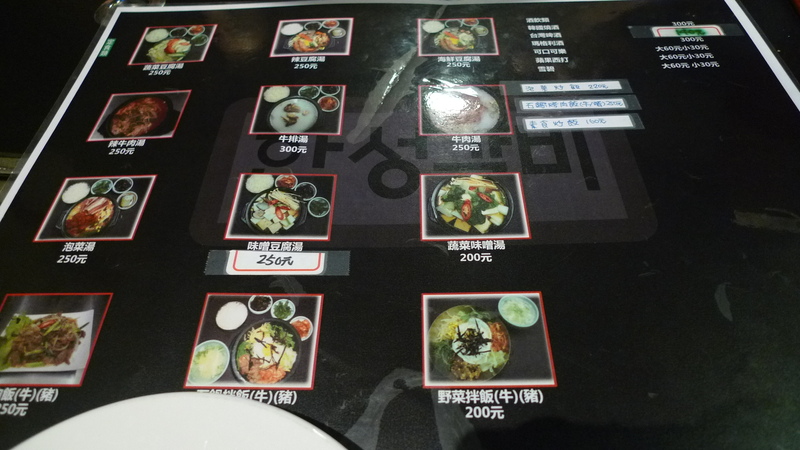 We usually go to a different Korean place down Telegraph, but we figured we’d try this place. The first time we went, I forgot my camera. Erin came down for the weekend and we went again, with my camera. The inside of this place is pretty big and pretty nice. 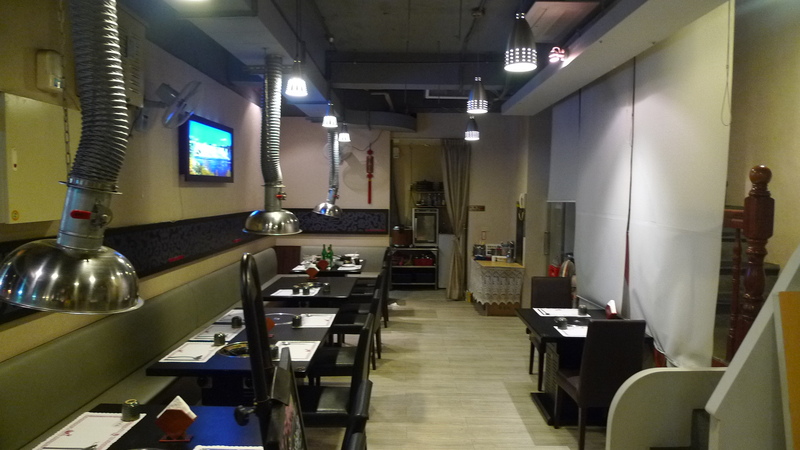 I guess this place does Korean BBQ as well; all the tables are equipped to BBQ. Inside of Jong Ga House. Once you order they give you a small bowl of cold kimchee soup with noodles. It’s pretty tasty. Then my favorite part, the side dishes. They give like 18 side dishes! It’s amazing! Jong Ga House has some sides that I’ve never gotten before and they are good! 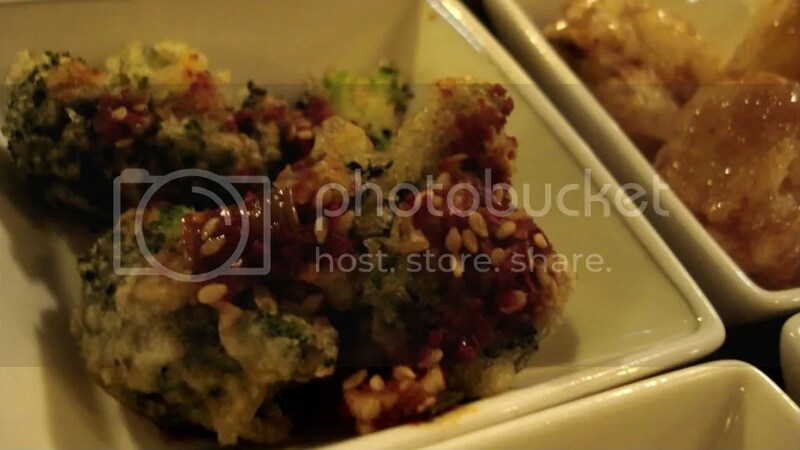 One of our favorites is the tempura-ed broccoli. It’s served cold with some dried chili(I think) on top. Another one of our favorites is the deep-fried potato pieces. 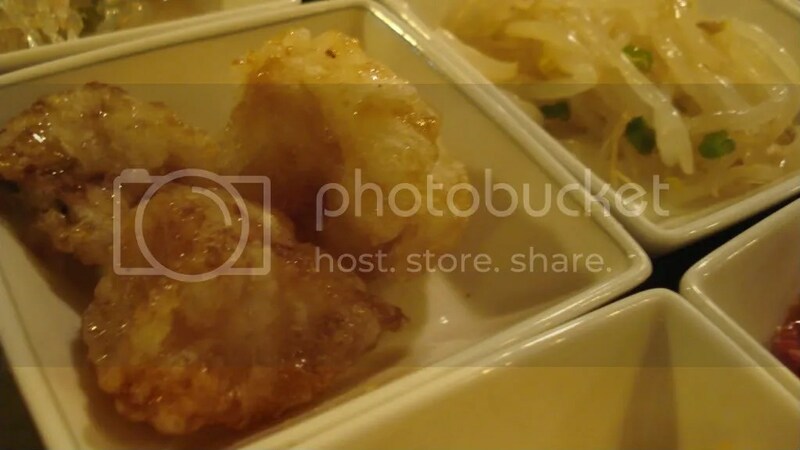 It’s fried in some kind of tempura like batter then drenched in a honey like sauce. It’s served cold, which makes the batter drenched in honey kind of hard, but it’s still really good. The menu here is quite extensive. They have something for everyone. Noodles, rice, soups, meat, veggies, seafood, they have it all. For someone like me, who is very indecisive, this menu is quite a feat to tackle, but I like that there are so many choices. After much deliberation I decided on the kimchee fried rice with beef ($9.95). 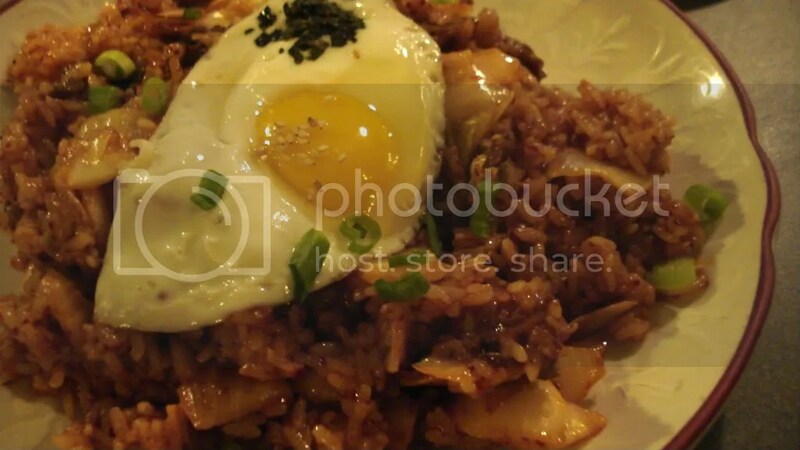 Kimchee Fried Rice with Beef. When I saw the plate come out it looked amazing; lots of kimchee and lots of sauce. I wasn’t expecting it to be as sweet as it was. Actually I wasn’t expecting it to be sweet at all, I mean, it’s fried rice. The first bite was interesting. For fried rice this was pretty saucy. The sauce was sweet with chili in it and I wasn’t sure if I liked it that much or not. 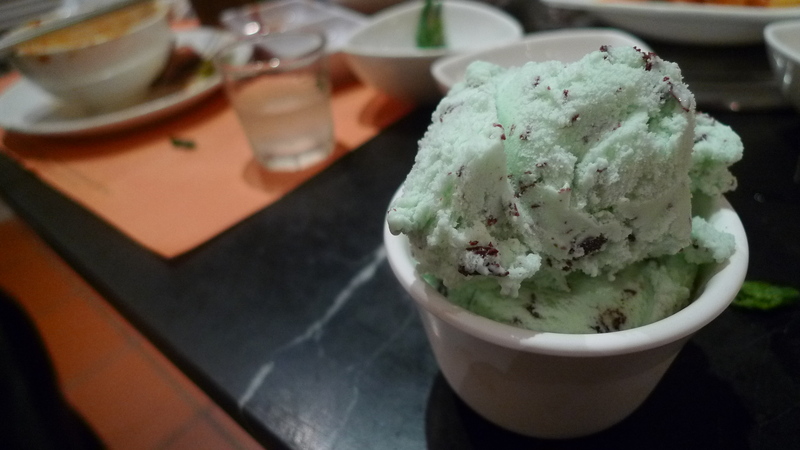 However, the more I ate it, the more I liked it. The beef in mine was a little tough. I felt like I got pieces with lots of gristle or something, but the ones that didn’t have it were good. The best part of it was all the chopped up kimchee. I love kimchee. I pretty much went to Korea to eat kimchee. 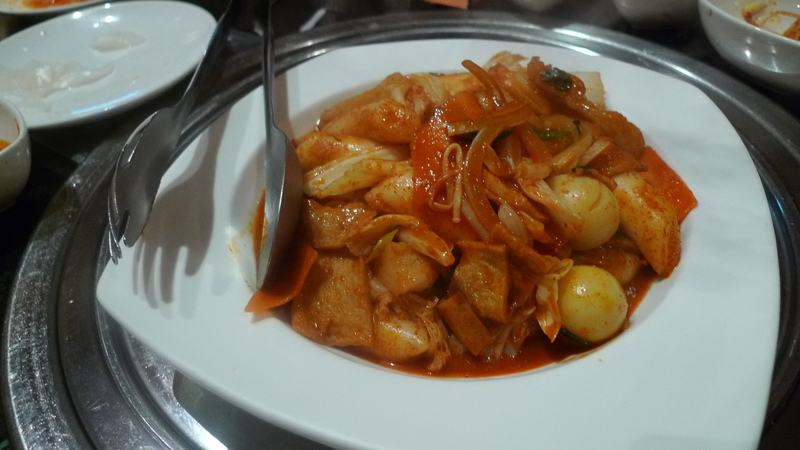 The kimchee was very good, not too vinegary, not too spicy, and still crunchy after being stir fried. Of course there was a sunny side up egg which seems to come with every Korean dish. I liked the yolk on the rice. I tend to like yolk on most things, but the yolk on the rice tasted really good. It kind of balanced out the sweetness of the rice. I only ended up eating half of my meal and taking the other half home. Honestly, I think I liked it better a day old and cold. It didn’t taste as sweet and the sauce made the rice kind of gooey in a good way. I don’t know that I’d get this again, but I’m glad that I tried it. Overall I love this place. The price is good for as much as you get and the service is great. Not to stero-type, but generally I’m not used to good service at Korean places unless I’m with someone who speaks Korean. At Jong Ga House the servers are attentive and very kind. They filled waters, cleared plates, and asked us if we wanted anymore side dishes, even though we hadn’t touched most of them they saw that we’d finished the ones we liked. 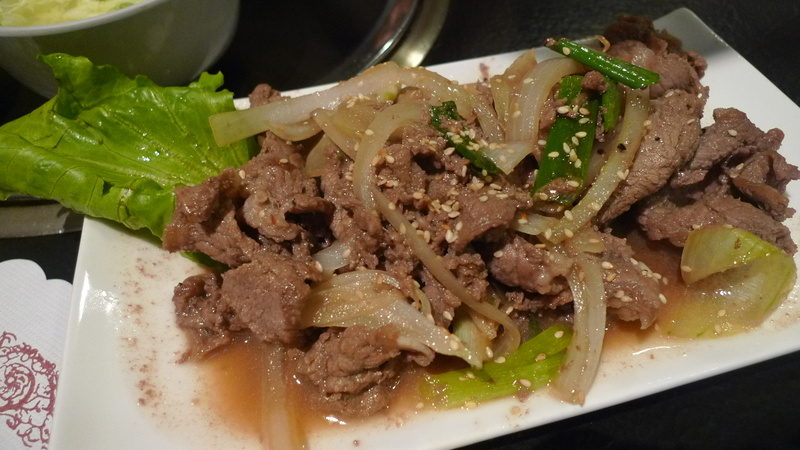 So, if you’re in the Oakland/Berkeley area and are looking for good Korean food, stop by Jong Ga House in Oakland. It’s good eats!